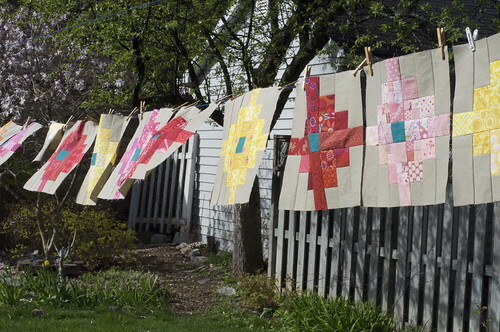 It's my pleasure to host Workshop in Progress today, since Cheryl has her hands full with Quilt Canada. She is involved with the professional development program and I'm sure she's getting lots of inspiration to share with us upon her return. Although I've got a full docket of projects at various stages of undress, I don't always manage to have something to share for Workshop Wednesday. 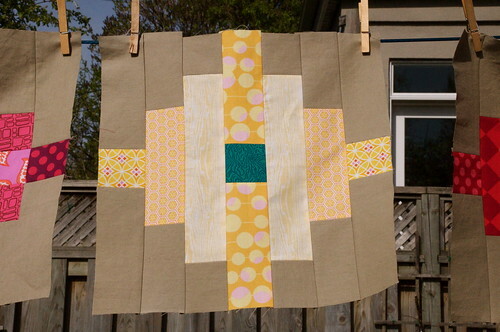 Today, however, I thought I would bring out my neutral blocks and ask for your thoughts around sashing. 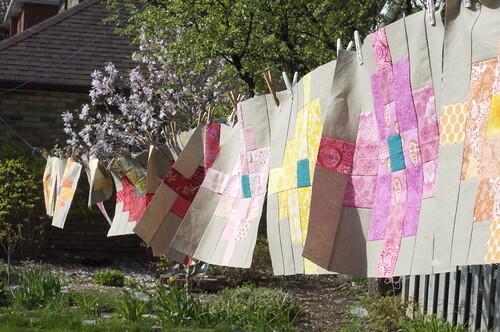 The last time I posted about these, several people suggested that sashing wasn't necessary. I'm not sure. One problem is that the blocks aren't all the same size. I made some fatal trimming errors on a couple of the blocks, but most of them are close to 8.5". 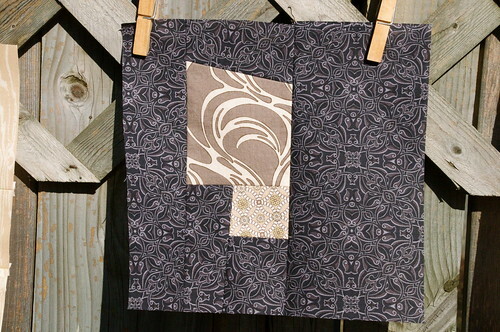 I pulled out three pieces of yardage that I thought would be possible sashing options, and here they are. The first one is an ivory cotton from Amy Butler. The second one is a green cotton, also an Amy Butler, if I recall correctly. The final choice is a Moda cross-weave cotton in natural (you can see that the block on the top right is one of the trimming casualties). Here's a slightly larger view of the cross-weave; you can see the natural and black threads a bit better. What do you think? Or would you still go for a non-sashed option? 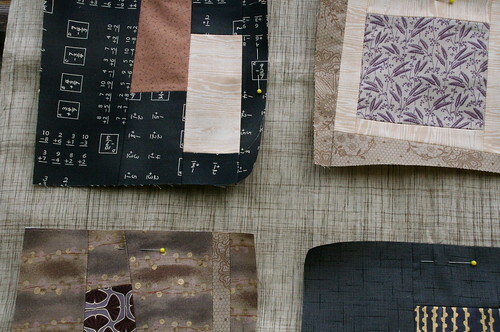 In other workshop news, Felicity is in a quandary about quilting choices. She's done a great Hungry Caterpillar quilt top and is now trying to decide on the best way to quilt the various features. 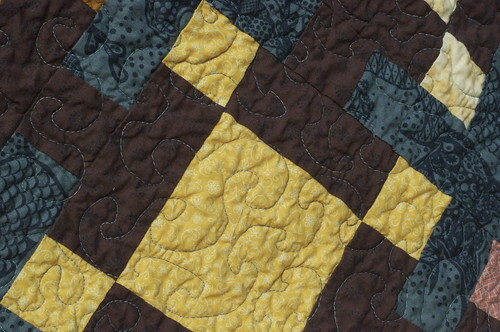 Her dilemma about becoming paralyzed through overthinking the quilting decisions vs rushing in without a plan just to get it finished really resonates with me. Let's go have a look and give her some ideas to ponder. I'm back from Nashville, and I feel duty-bound to report that I went to two fabric shops. I was so close to Paducah, but, alas, not close enough to attend the quilt show. I did pick up a few things - not too much, since I had customs/duty to consider on my return, plus any potential charge for overweight baggage. 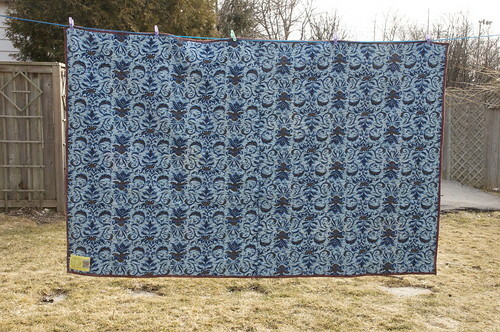 A couple of fat quarters and some yardage of Echino linen found their way into my suitcase *rubs hands and chortles*. While I was away, I received some of the amazing blocks that have been made for me by the members of the Modern Tradition Quilt Bee. I want to show them to you, but it will probably take more than one post to do so. 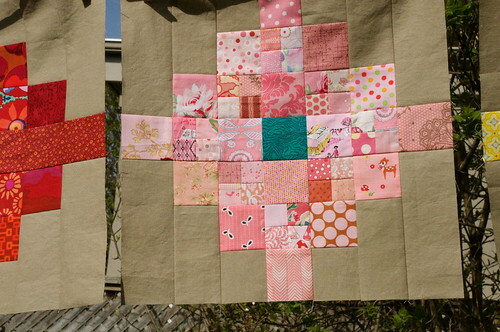 Since everyone made two blocks, I have 18 so far, including the four that I made in February. There are another six or so to come in. I started with the pattern Granny's Flower Garden, but asked the bee members to be creative and adapt the pattern however they would like, keeping the blue/green flower centre and the background strips consistent. 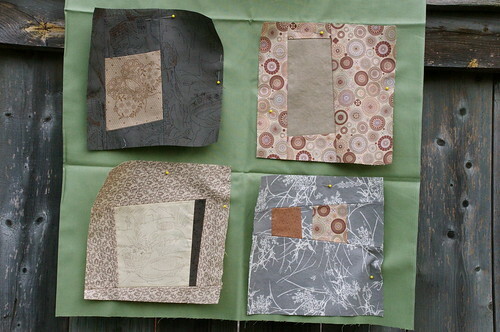 I sent fabrics in several colourways: red, dark/light pink, yellow and orange. The background is Essex linen in putty. Here's one from Lydia. 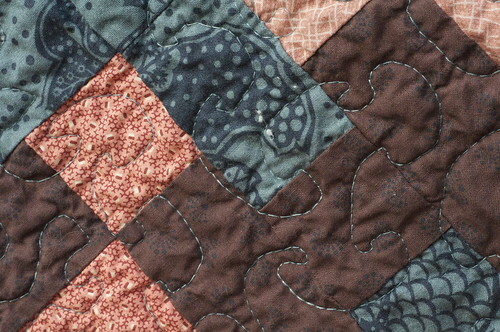 Can you see how she made crazy-quilt pieces on the sides of the flower? I love this one from Norma. See how it's almost symmetrical, except for two blocks. And how about this one from Melissa? I think it looks like a pansy! This one knocks my socks off. It's from Rachel. 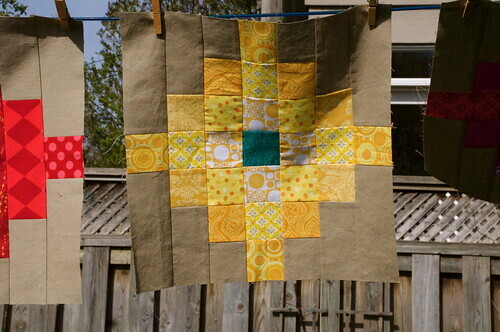 Isn't this one from Leanne so sweet in pale yellows? Lydia made this one, too, and she added that darling fairy at the top of the flower. 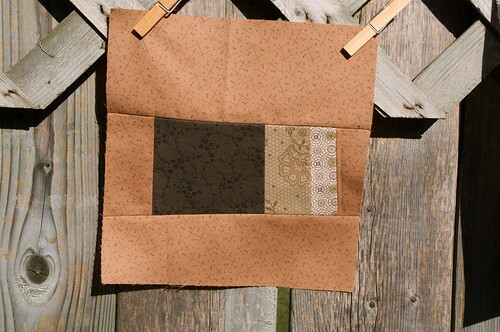 Can you see how Rachel made some of those 2" squares out of tiny four-patches? Plus she added some Flea Market Fancy! I think this one from Norma is a real winner. 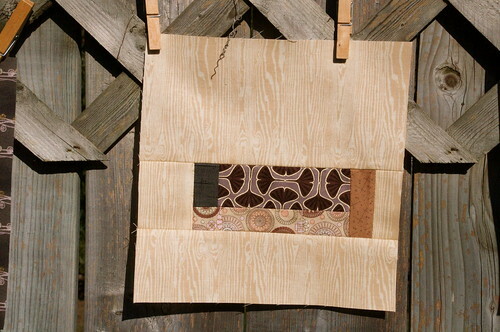 The horizontal and vertical pieces look woven. Look at these little paisleys around the centre! I love this one from Sandra. It was a glorious day yesterday! 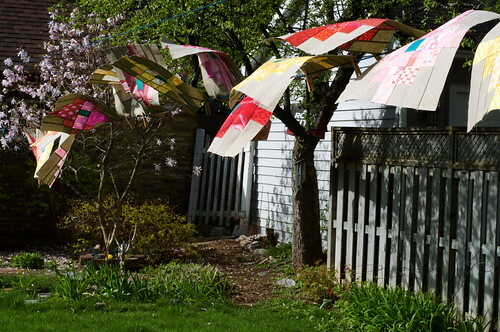 I really enjoyed seeing all these blocks flapping in the wind. 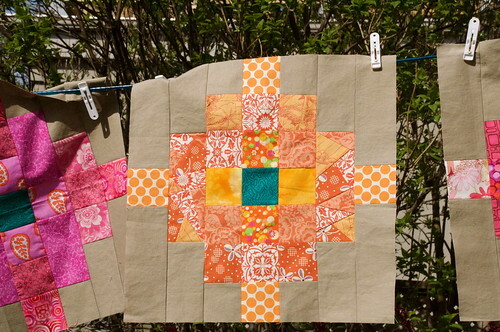 I can't wait for the remaining few to come in so I can assemble the quilt top! 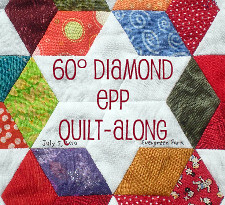 No quilting pictures for this post, y'all. I'm in Nashville for a conference on special education. I didn't bring my camera because I planned to be in sessions most days and didn't think I'd be doing much touring. Who knew I needed my camera for the hotel itself! I'm staying at the Gaylord Opryland Hotel; at 2,800 rooms, it is the largest non-gaming hotel in North America. Go check out the link above and remember that everything you see in this little video is all inside the hotel - waterfalls, boats, palm trees, gazebos, it's all inside. Wow! No post is complete, however, without a photo of some kind. 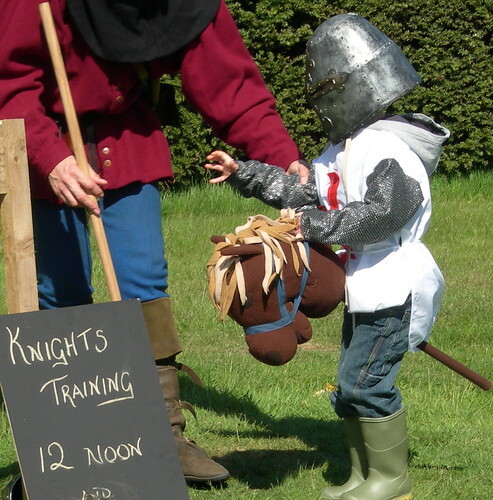 So, in honour of St. George's Day tomorrow, I am posting this snap of a young knight on a training run. This time last year, I was in the UK, visiting my friend Clare, and we took a day trip to Battle, East Sussex (site of the Battle of Hastings). We came upon a kind of medieval fair with re-enactors who were jousting, cooking over fires and drinking mead with great enthusiasm. Speaking of Clare, she and Nigel are to be married on Saturday. Cheers, Clare! Wishing you both a long and happy life together! My daughter is home safe from her trip to Poland and Israel - thanks for all your kind wishes as we waited in suspense about the volcano's effects on her return. Spell-check says "lootful" is not a word. But it should be! I am not normally a lucky person, in the win-the-lottery, doorprize or giveaway sense. In the good health, family and career success sense, I have been extraordinarily lucky, and, please G-d, may it continue! However, in the last week or so, I've also been lucky in loot. Let me show you! First, I won this book from the ever-generous Thelma. 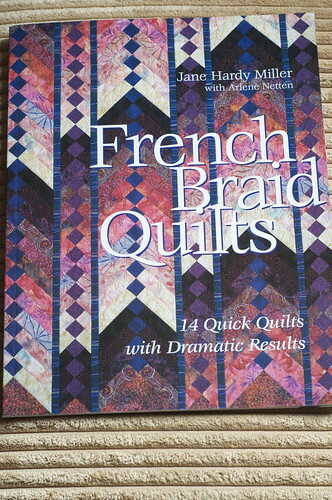 I've always been interested in French Braid quilts. There are some gorgeous ones in here, and they don't look too hard to make. Thank you, Thelma! 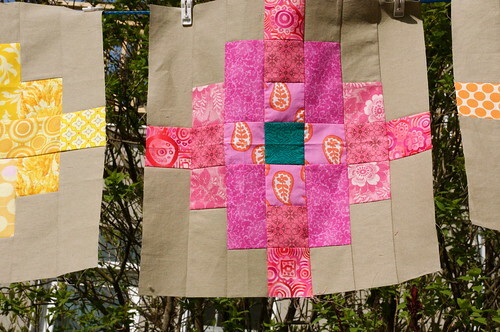 Second, you probably know that it's Quilt Month on Sew Mama Sew. 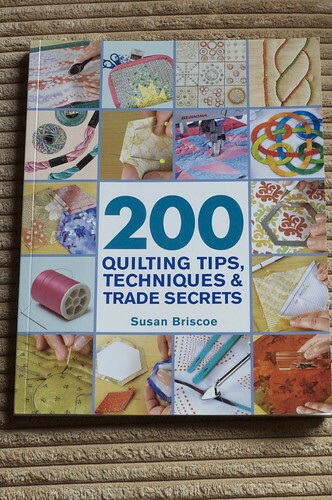 I won this book from them. Lots to read about and learn in here! And look at these cute greeting cards! 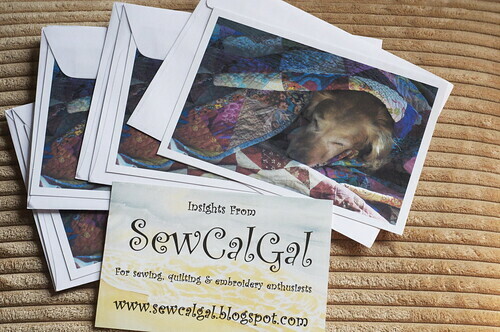 They were made by SewCalGal - she liked the photo of Darla that appeared in this post, and offered to make them up for me, out of the blue. What a great (sewcal)gal! I was so touched to receive them! 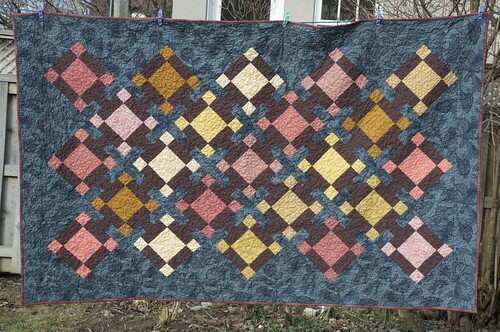 Finally, I have been getting completed blocks returned from the Modern Tradition Quilt Bee. These are so fabulous, each one unique - my socks are well and truly knocked off - that they deserve a post of their own. Once they're all in, I'll do that thing. And now for the outgoing portion of this lootful post. 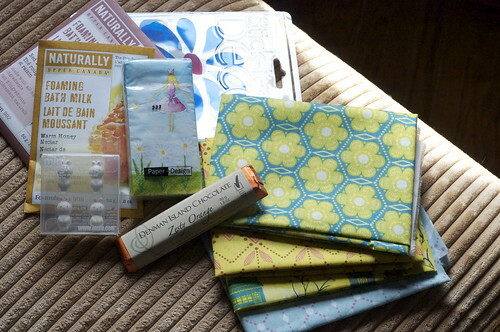 I'm just about to send off my package to my mystery partner in the Old Red Barn Co. spring swap. Here's a look at the secret ingredients. 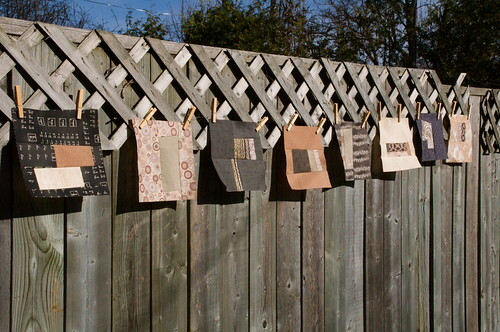 Because I'm feeling flush after my Quilthome sale order of AMH voiles came in, I'm parting with four of the FQs I've hoarded. I hope my partner enjoys them, along with the other little goodies I've thrown in. I'm off to Nashville in a few days - going to the annual meeting of the Council for Exceptional Children. If anyone knows any good LQS that I should visit in the Nashville area, please let me know! My daughter is on the March of the Living. The March is a two-week trip for Jewish teens and young adults that comprises one week in Poland and one week in Israel. In Poland, the young people tour the Warsaw ghetto, various old synagogues, cemeteries and, of course, the concentration camps. Yesterday was Yom HaShoah, or Holocaust Remembrance Day. Yesterday, 10,000 Jewish young people from all over the world marched from Auschwitz to Birkenau, symbolically retracing the steps of those unfortunate souls. In the photo above, taken in a Jewish cemetery in Kielc, Poland, my daughter is on the left, being comforted by David Shentow, a Holocaust survivor from Ottawa. It is a very emotional for these youngsters. I am very proud of my daughter, for having the courage to go on this life-changing trip so far away from home and family. But I will also be very happy to have her home again. Spiderweb block, originally uploaded by Shadrach Meshach & Abednego. 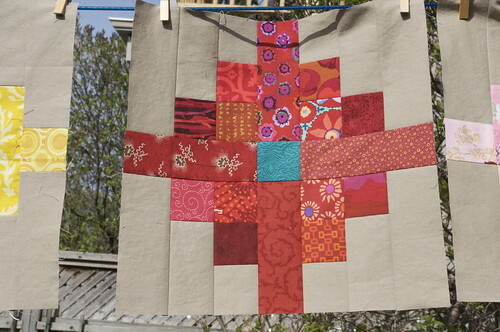 There's a new swap setting up - it's for spiderweb blocks. I said I would do it, but here's the thing. I'm really ambivalent about those centre "kites". Seems like everybody is having them done in white, or sometimes gray, but these don't resonate with me. I definitely don't want white. I have two big dogs - need I say more? And gray just doesn't thrill me for he background for this block. 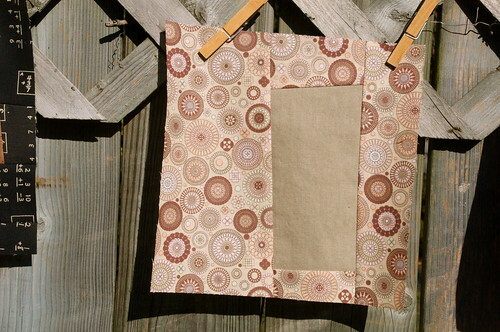 I kind of like this cocoa-coloured background, but not enough to make one like it. 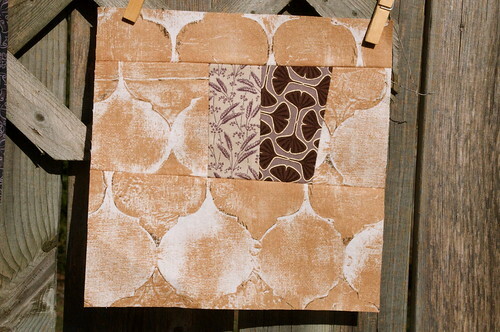 So I made a block today, using this green and ivory print from Amy Butler's Love line. I really can't tell what I think about it. I try imagine a whole quilt made with it. I think it would work - the pattern is obvious, but not too aggressive. And let me tell you, this block is some heavy lifting, timewise. I have to really like it to press ahead. So, is this block inspired or insane? 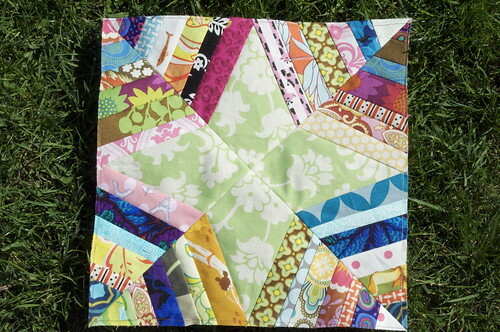 Edited to add that I Have a Notion is having a giveaway for an Accuquilt Go. Talk about insane AND inspired! It's part of their 30 days of giveaways marking the 1 year anniversary of their store, and you can enter for a chance at any of the prizes on posts from March 15 - April 15 until April 15 at 10pm CMT. Goin' to the chapel and we're gonna get married. Goin' to the chapel and we're gonna get married. Gee, I really love you and we're gonna get married. Goin' to the chapel of love! Yay, the big reveal! My friend, Clare, is getting married near the end of this month. 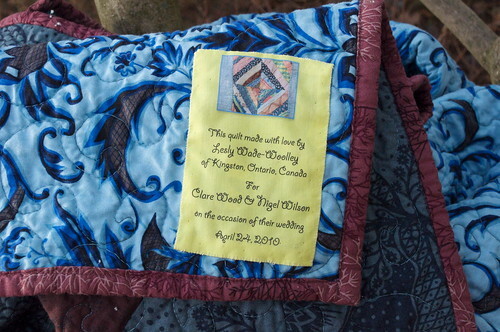 This is the quilt I made for her. 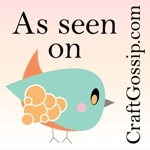 I'm so excited to be able to blog about it at last! Clare and Nigel live in Northampton in the UK. I was so nervous about sending this through the mail. It would have cost the price of a small nation to send it with a tracking number, so I closed my eyes and crossed my fingers and hoped for the best. It took less than two weeks to arrive! It was hard to pick what to make for Clare. In my opinion, Clare wears too much black. Actually, she is a recovering Goth, and it's a sign of her rehabilitation that she has extended herself to wearing navy! As well, Clare is deeply superstitious about green. She won't wear anything with green or have any green decor - green is unlucky. 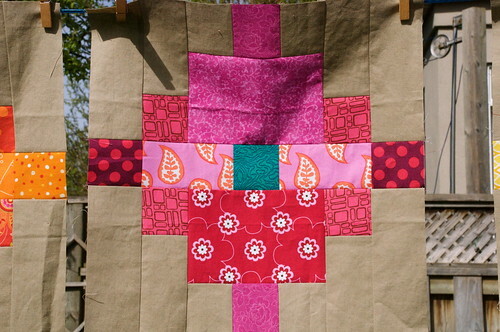 I think this quilt is perfect for Clare - it has the navy that she loves along with the pinks and yellows I wish she would wear! And nary a fleck o' green! 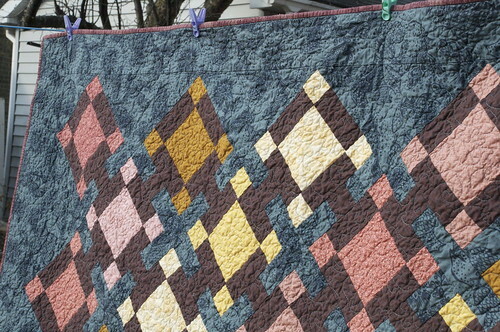 I love this quilt - I wanted so badly to keep it for myself, but Lindsay wouldn't let me. 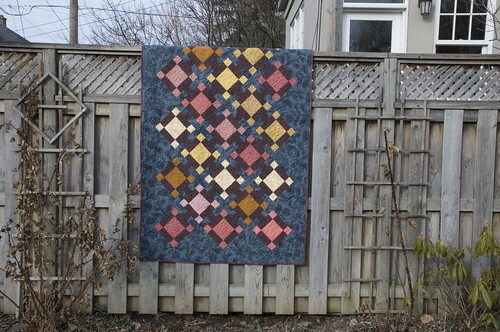 I used a pattern called French Garden by Heather Mulder Peterson. I love the way the Anna Maria Horner blue background worked out. 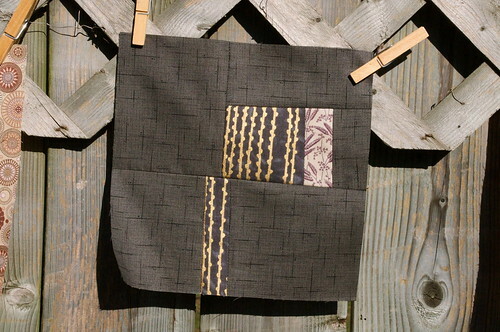 This is the first time that I've made a quilt with a dark background and I like it A LOT. 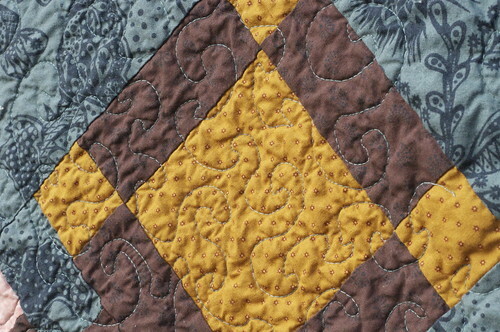 I used a King Tut thread variegated in blues for the quilting. The back is a Jennifer Paganelli print. And how about my label? I made it in Word and printed it on one of those Printed Treasures sheets. Ok, I am way outside my comfort zone with these blocks and I could use a bit of advice. In my last post, I showed a stack of neutrals that I bought last week. 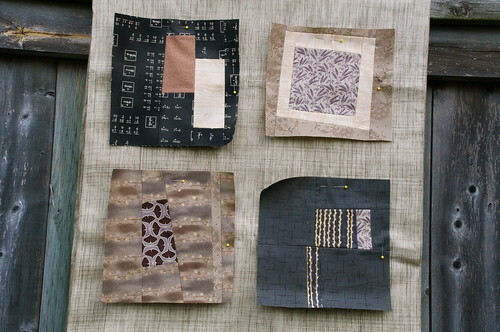 I haven't been able to stop thinking of them, and I decided they would be great for a quilt for my friend, Marcia, who moved to Houston to take up a research chair at the university there. 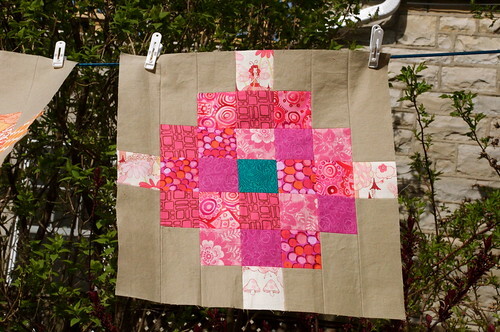 I've been wanting to make her a quilt for a (belated) housewarming gift, and this seemed like just the ticket. She is a very classy lady, and these understated colours are just her tones, and would fit in several rooms of her new home. This block is a bit of an inside joke, since Marcia is a researcher in mathematics disabilities. She'll love this one. I do really like these colours together, but they are so far away from the palette I normally prefer. 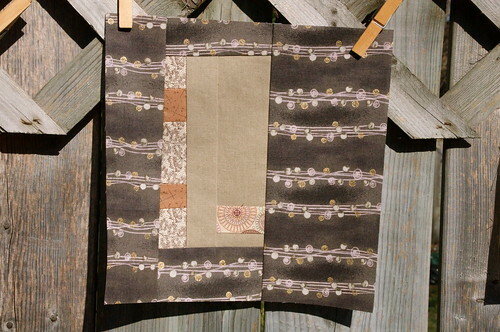 In fact, initially, I thought I would make these improv blocks with taupes, tans and grays, and that I would add in a very few splashes of colour, maybe a burnt orange or a purple, on a block or two. I figured I'd make a few blocks and then see how they strike me - if they need me to make a couple of blocks with a bit of colour injection. But at the moment, I'm thinking I should just leave additional colour out. Seems like there's enough going on with the different prints, and we may have a case of less being more. 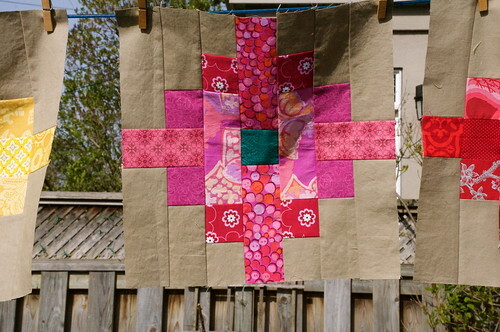 I'm not even 100% sure these blocks work - I'll be back asking for more advice when it comes to sashing, so stay tuned. What do you think? Colour needed, or carry on the way I've started? Oven Fire, originally uploaded by akeg. Disclaimer: Not my oven and not my photograph! Greetings, dear friends, if anyone is still around to read my blog, seeing that I haven't posted in over a week. Please forgive: the last 10 days have been an utter blur. I was in Toronto for some of that time, to do a bit of work with a colleague and friend who has moved to Texas, but who still has a lab at the Hospital for Sick Children. When she comes to Toronto I try to make a trip in so we can hobnob and plan great research projects, and sometimes take in a little shopping. 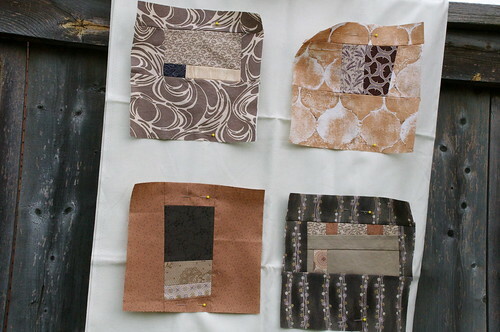 While she was doing some of her work, I went to The Workroom to look around a bit and pick up some neutrals for my stash. The Workroom is a nice fabric store - it is a little self-consciously hip, and I definitely feel a bit too old and out of the loop when I shop there, but their stock is good, and different from what I can find at my LQS. And they have a wonderfully gentle and welcoming dog, Maisie, who doesn't care that I am closer to 50 than 27. 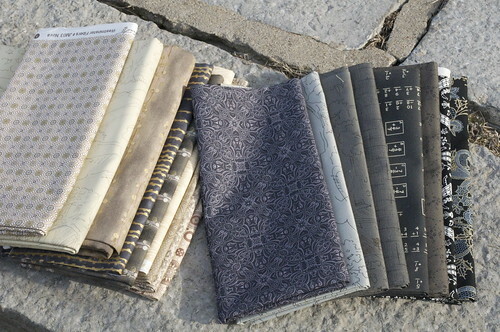 I did get some awesome fabric in tan, grey and black, which I think would make a gorgeously understated quilt all together. 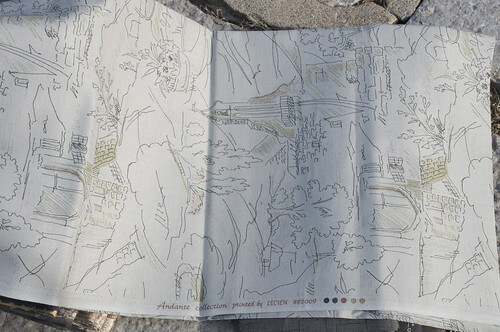 I got a few pieces from a Lecien line called Andante that I hadn't seen before - very nice. When I came home, it was full steam ahead on Passover cleaning. My husband and daughter were in Montreal, so I did it all alone. Never mind, at least I got to turn my music up full blast! I also began the Passover cooking. From a cookbook called Jewish Slow Cooker Recipes, I made a brisket with a dry spice rub which was amazing. I also made a flourless cake using ground almonds, grated fresh ginger, apples and egg whites. And my favourite kugel of all times, an apple-matzah kugel with dried fruit, plus my daughter's favourite, chicken soup with matzah balls. Anyway, everything was under control, and I was able to relax a bit with my family when they returned, bringing my mother-in-law with them for the seders. 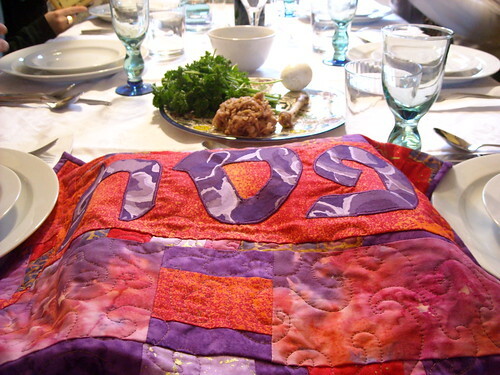 Monday night we had the first seder at Susan's. The matzah cover I made for her looked beautiful on her table. She took some photos and when she forwards them I'll post so you can see here's one. The second seder was at our house. I had prepared almost everything for the meal in advance, with the exception of the mustard-roasted potatoes. However, I did forget one thing. On the ceremonial seder plate, there are six things, one of which is a roasted bone to represent the Passover sacrifice. Normally, I reserve a chicken leg bone which is leftover when I make the chicken soup and roast that, but this time I tossed everything in the bin. On Monday I had to run out to the store. I bought a pack of beef shank bones, thinking I would roast them all and make beef stock from the remaining bones. I roasted them in the oven on a pan with a small lip, and you can guess what happened. The fat from the shank bones spilled over the pan. At first there was just lots and lots of smoke, billowing out of the vent in the oven. Then there were flames. The photo above is not my oven, but it is my oven's twin. I threw baking soda on the flames and they died down, but I could barely see in all the smoke. Oh, it was a mess, and only two hours to go before our guests were called for the seder! Although it was terribly cold and windy outside, I had my poor 83-year-old MIL bundled up in her coat standing out on the back porch while I tried to rustle up some fans to disperse the smoke. The dog was very upset and anxious, and kept getting underfoot. In the end, everything ended well and we had many a good laugh. The oven was hors de combat, so I wrapped everything that needed to be reheated in aluminum foil and set it all to steam on the stove. Let me tell you, I sure did enjoy my four cups of wine at the seder! And one other thing was on our docket this week. 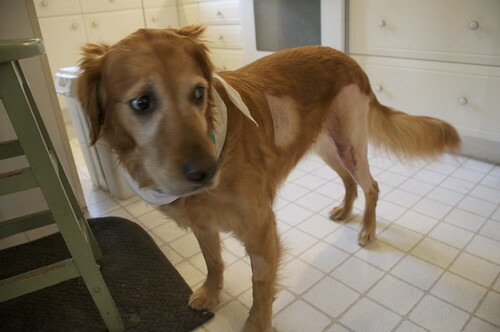 Our younger golden retriever, Darla, had surgery to repair a torn ligament in her knee. The poor thing, she came home on Wednesday and has really struggled with the changes in routine that we've had to put in place to restrict her activity, besides looking terribly bedraggled and uncomfortable. Here you see how she's been shaved for surgery on her back leg, but also for a pain patch on her side and the IV in her front leg. Poor little thing. All this to say that things have been very hectic, and there's been No Sewing this week at all. 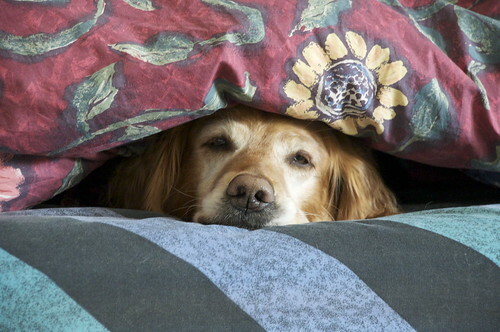 Frankly, I've ended up this week wishing I could do like our other dog, Susie, in this photo. 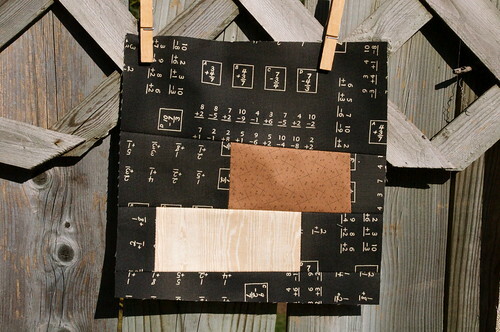 With luck, I can get a bit of sewing done this weekend!